Read the instructions and Register here! I’m writing about the fees . It is not clear if the discounts apply ONLY until 23rd February ( when we won`t know whether our proposals have been accepted or not). The list of fees states , for example : UNtil 3rd April ( non member ) $780. Does this apply to the situation of a presenter who pays until the 23rd fEBRUARY or until 3rd April ? Promo fees apply until February 23rd. 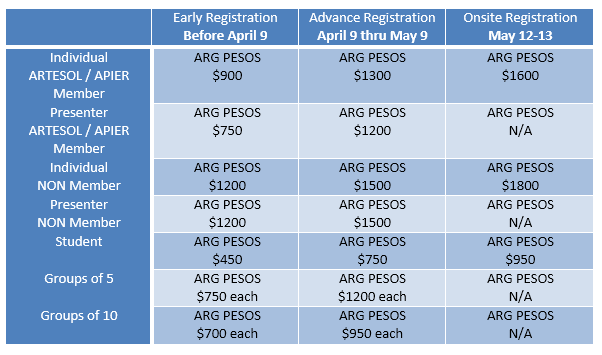 Early-bird registration fees are valid thru April 3rd. If you are a presenter, and you are not planning to attend the convention if your proposal is not accepted, we consider the early-bird registration fee will be more convenient. I pre registered but I’m not sure which fee I will have to pay. I’m not a presenter and I’m not a member of APIER. In the pre registration form, I ticked “other” and specified “non member “. Is that right? I would like to know if I can make a deposit from some else’s bank account because I don’t have a bank account of my own. Thank you! Sure, Valentina. Just send a scanned copy of the deposit slip to artesol.office@gmail.com Don’t forget to include your name. That’s right, Magda. The fee that applies is the Non-Member fee. I pre registred but I haven’t sent the Monetyet yet..Could I Send after 3rd April? I would like to know the starting time of the conference. Thanks! We usually start registration on Friday at 8:30. The opening ceremony starts at around 9:30 and the first plenary at 10. Looking forward to seeing you at ARTESOL 2017. Hello. I am studying to be an English teacher. I want to know if I have to register as a student or as a non-member. Thank you. Please, register as a student. See you at ARTESOL 2017.